It's that time of year again! We know that the San Diego Comic Con is not the only massive comic and pop culture convention out there, but it's the only one that Bongo attends in full force and we're always excited when it rolls around. Come on down and join us Wednesday, July 11th, to Sunday, July 15th, in the San Diego Convention Center for four days and one wild preview night. The Bongo Comics booth is located at #2519 on the Comic-Con international floor, just inside Hall C. We will do our very best to bring that Bongo brashness to the occasion! Other than meeting the whole Bongo Comics staff, you’ll brush shoulders with writers, artists, editor-types, people who color real good, and extra neat letterers who can create huge sound effects with a sweep of the stylus. There will be exclusives; there will be tchotchkes; and there will be comics galore! We look forward to seeing our regular convention buddies and can't wait to meet new friends. If you're a fan of Bongo, we'd love to meet you and say thanks for your support! Who knows, you may even walk away with something cool! It’s taken nearly twenty years to arrive, but everyone at Bongo is excited for the imminent release of Radioactive Man: Radioactive Repository Volume One. 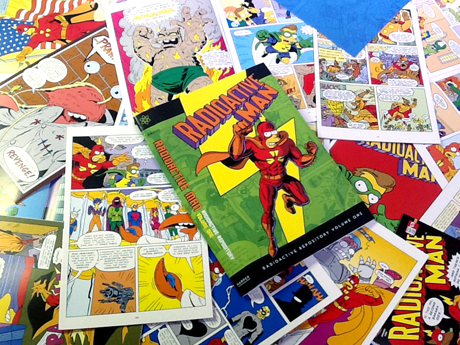 This massive 272-page hardcover gathers Radioactive Man’s classic adventures into one impressive archival collection. We just got our advance copies and they look awesome. For those not in the know, we’ve always presented and numbered the Radioactive Man series as if each comic was found in the back issue bin at the Android’s Dungeon. Just think…maybe your copy of Radioactive Man #216 is the same one that a naïve Disco Stu sold when he traded in his comic collection to buy his first pair of polyester pants. It’s meta enough to boggle the mind! Join the Atomic Avenger as he fights for truth, justice, and a way to remove the radioactive, lightning bolt-shaped metal shard from his head! In stores all across America on July 17th.